Though modern homes are designed to be airtight, to lock in as much heat as possible, it’s equally important that the roof of a building is well ventilated. This ensures that naturally forming condensation and moisture can escape. An effective solution to this issue is the simple addition of roof vents. Lots of things we do in our everyday lives create steam. Whether that be cooking, taking a shower or using a washing machine, it’s vital that this moisture can escape through the roof of the building. If it doesn’t escape, the condensation will soak loft insulation and could eventually lead to damp and rot – meaning big repair bills for homeowners. 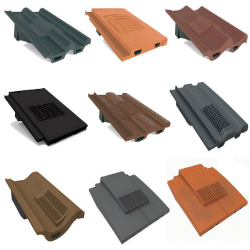 Roof tile vents are designed to provide low- or high-level ventilation. Low-level ventilation allows cool air to enter the roof space and circulate, whereas high-level ventilation draws the rising warm, damp air out of the roof space. If you’re determined to ventilate your roof as much as possible, take a look at our selection of breather membranes. These permeable underlays are designed to protect your roof from the elements, as well as allowing moisture and water vapour to escape. We appreciate that an aesthetically pleasing finish is important to homeowners. That’s why we offer roof vents in a range of colours and materials, including slate vents. Browse our full collection and place your order online today. We’re also happy to provide free and impartial advice, as well as more information on any of the products in our range.